WhiMSy love: Totally Random. Totally. These things are non-related, & severely random, but I just had to share, ya know? First off, I had to show the miniature horse decked out in the new play-doh fashions (with wee pumpkin accessory), created by my 4-year old, who was obviously rockin' it with her tiny crafty self. Someday I'll get a GREAT shot of the sunsets we have around these parts. This was from my kitchen window. Totally blurry, totally doesn't give any idea of what awesomeness I'm talking about. I'll work on it. Out "shopping" at Lowe's one day with Tia, for free paint swatches, I spotted this ADORABLE little holiday rug!! Me wants. Gross Bug Alert. A couple weeks ago I saw this most DISGUSTING bug by my car.I didn't want to get too close to it when taking the picture for fear it would stand up on its back legs & slap me across the face. It was about 2 inches long! And plump & weird! Ewwww! It seriously sent shivers all over me. I was told by some of my most brain-i-ac family members that it is a potato bug. Click HERE for further proof. I think I found this while browsing Pampering Beki's blog. 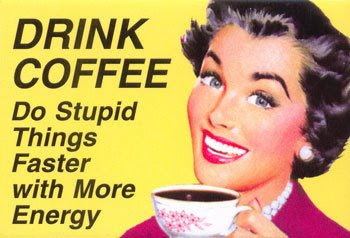 I am not a total coffee drinker, but I LOVE this! HAHA! Oh, & speaking of Beki, she's organizing a blogger ornament exchange. I signed up (I'm #45!) & you have until the 25th of October to join, so HURRY! This is my screen saver. Bubbles. They bounce & change colors & everything. Sweet. Tute alert! This weekend I'll have one ready for ya. YAY! Alright, that's enough randomness for one day. Cute stuff. Had a laugh over the toilet cleaning. As a coffee drinker, I have to lift that photo off your page. This is a cute post. Your girls can come and clean my tiolet anytime. I linked to you in my blog post today.